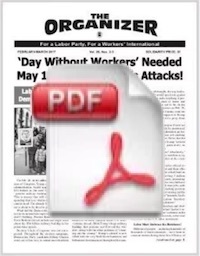 Socialist Organizer, which was founded in 1991 in continuity with the best traditions of the Socialist Workers Party (SWP) and the Fourth International, decided at its inception to name its monthly newspaper after the strike newspaper published by the Minneapolis striking truck drivers in the spring and summer of 1934: The Organizer. We did this to denote our direct link to this seminal chapter in the history of American Trotskyism. The article below is by James P. Cannon, founder and leader of the SWP. Cannon was born on February 11, 1890, in Rosedale, Kansas. He joined the Socialist Party of America (SPA) in 1908 and the Industrial Workers of the World (IWW) in 1911. He was an IWW organizer throughout the Midwest from 1912 through 1914. Cannon was an important founder and leader of the Communist Party until his expulsion in 1928 from the Stalinized CP for refusing to denounce Leon Trotsky. He was national secretary of the Communist League of America (CLA), the Workers Party of the United States, and the Socialist Workers Party until his retirement and move to California in 1953. He died on August 21, 1974. The following text is reprinted from the Marxists Internet Archive (MIA). It was published initially in Fourth International magazine in May 1944 (page 140, Vol. No. 5). The year 1933, the fourth year of the great American economic crisis, marked the beginning of the greatest awakening of the American workers and their movement towards union organization on a scale never seen before in American history. That was the background of all the developments within the various political parties, groups and tendencies. This movement of the American workers took the form of a tremendous drive to break out of their atomized state and to confront the employers with the organized force of unionism. This great movement developed in waves. The first year of the Roosevelt (1932) administration saw the first strike wave of considerable magnitude yield but scanty results in the way of organization because it lacked sufficient drive and adequate leadership. In most cases the efforts of the workers were frustrated by governmental “mediation” on one side and brutal suppression on the other. The second great wave of strikes and organization movements took place in 1934. This was followed by a still more powerful movement in 1936-37, of which the high points were the sit-down strikes in the auto and rubber factories and the tremendous upsurge of the CIO. Our lecture tonight deals with the strike wave of 1934 as represented in the Minneapolis strikes. There, for the first time, the effective participation of a revolutionary Marxist group in actual strike organization and direction was demonstrated. The basis of these strike waves and organization movements was a partial industrial revival. This has been mentioned before and must be repeated again and again. In the depths of the depression, when unemployment was so vast, the workers had lost their self-confidence and feared to make any move under the ominous threat of unemployment. But with the revival of industry, the workers gained new confidence in themselves and began a movement to wrest back some of those things which had been taken away from them in the depths of the depression. The ground for the mass activity of the Trotskyist movement in America was, of course, laid by the action of the masses themselves. Our comrades in Minneapolis began their work first in the coal yards, and later extended their organizing campaign among the general drivers and helpers. That was not a preconceived plan worked out in the general staff of our movement. The drivers of Minneapolis were not by far the most decisive section of the American proletariat. We began our real activity in the labor movement in those places where the opportunity was open to us. It is not possible to select such occasions arbitrarily according to whim or preference. One must enter into the mass movement where a door is open. A chain of circumstances made Minneapolis the focal point of our first great endeavors and successes in the trade union field. We had in Minneapolis a group of old and tested Communists who were at the same time experienced trade unionists. They were well-known men, rooted in the locality. During the depression they worked together in the coal yards. When the opportunity opened up to organize the yards they seized it and quickly demonstrated their capacities in the successful three-day strike. Then the extension of the organizing work to the trucking industry generally followed as a matter of course. Minneapolis wasn’t the easiest nut to crack. In fact it was one of the hardest in the country; Minneapolis was a notorious open-shop [non-union] town. For fifteen or twenty years the Citizens Alliance, an organization of hard-boiled employers, had ruled Minneapolis with an iron hand. Not a single strike of any consequence had been successful in those years. Even the building trades, perhaps the most stable and effective of all the craft unions, were kept on the run in Minneapolis and driven off the most important construction jobs. It was a town of lost strikes, open shops, miserably low wages, murderous hours, and a weak and ineffectual craft-union movement. The coal strike [begun on February 7, 1934] was a preliminary skirmish before the great battles to come. The smashing victory of that strike, its militancy, its good organization and its quick success, stimulated the general organization of the truck drivers and helpers, who up to that time and throughout the years of the depression, had been cruelly exploited and without benefit of organization. True, there was a union in the industry, but it was holding on to the ragged edge of nothing. There was only a small handful of members with some poor kind of contract with one or two transfer companies-no real organization of the mass of truck drivers and helpers in the town. The success of the coal strike uplifted the workers in the trucking industry. They were tinder for the spark; their wages were too low and their hours too long. Freed for so many years from any union restraints, the profit-hungry bosses had gone too far-the bosses always go too far-and the ground-down workers heard the union message gladly. Our trade union work in Minneapolis, from beginning to end, was a politically directed campaign. The tactics were guided by the general policy, hammered home persistently by [our weekly national newspaper] The Militant, which called on the revolutionists to enter into the main stream of the labor movement represented by the American Federation of Labor. It was our deliberate course to go along the organizational line the masses were travelling, not to set up any artificially constructed unions of our own in contradiction to the impulse of the masses to go into the established trade union movement. For five years we had waged a determined battle against the ultra-left dogma of “Red Unions,” such unions set up artificially by the Communist Party were boycotted by the workers, thus isolating the vanguard elements. The mass of the workers, groping for organization, had a sound instinct. They sensed the need of help. They wanted to be in contact with other organized workers, not off on a sideline with some howling radicals. It is an unfailing phenomenon: The helpless, unorganized mass in industry have an exaggerated respect for established unions, no matter how conservative, how reactionary, these unions may be. The workers fear isolation. In that respect they are wiser than all the sectarians and dogmatists who have tried to prescribe for them the exact detailed form of a perfect union. In Minneapolis, as elsewhere, they had a strong impulse to get in with the official movement, hoping for its assistance in the fight against the bosses who had made life pretty tough for them. Following the general trend of the workers, we also realized that if we were to make the best of our opportunities, we should not put unnecessary difficulties in our path. We should not waste time and energy trying to sell the workers a new scheme of organization they did not want. It was far better to adapt ourselves to their trend, and also to exploit the possibilities of getting assistance from the existing official labor movement. It wasn’t so easy for our people to enter the American Federation of Labor in Minneapolis. They were marked men who had been doubly expelled, doubly damned. In the course of their struggles they had been thrown not only out of the Communist Party, but also the American Federation of Labor. During the “Red Purge” of 1926-1927, at the height of the reaction in the American labor movement, practically all of our comrades who had been active in the trade unions in Minneapolis had been expelled. A year later, to make their isolation complete, they were expelled from the Communist Party. But the pressure of the workers toward organization was stronger than the decrees of trade union bureaucrats. It had been demonstrated that our comrades had the confidence of the workers and had the plans whereby they could be organized. The pitiful weakness of the union movement in Minneapolis, and the feeling of the members of the craft unions that some new life was needed-all this worked in favor of our people making their way back into the American Federation of Labor through the Teamsters Union. In addition, there was the fortuitous circumstance, a lucky accident, that at the head of Local 574 and the Teamsters Joint Council in Minneapolis was a militant unionist named Bill Brown. He had a sound class instinct, and he was strongly attracted by the idea of getting the cooperation of some people who knew how to organize the workers and give the bosses a real fight. That was a fortunate circumstance for us, but such things do happen now and then. Fortune favors the godly. If you live right and conduct yourself properly, you get a lucky break now and then. And when an accident comes your way-a good one-you should grab it and make the most of it. We certainly made the most of this accident, the circumstance that the president of Teamsters’ Local 574 was that wonderful character, Bill Brown, who held open the door of the union to the “new men” who knew how to organize the workers and lead them in battle. But our comrades were new members in this union. They weren’t in there long enough to be officers; they were just members when the fight began to pop. So not a single one of our people-that is, members of the Trotskyist group-was an official of the union during the three strikes. But they organized and led the strikes just the same. They were constituted as an “Organizing Committee,” a sort of extra-legal body set up for the purpose of directing the organization campaign and leading the strikes. The organizing campaign and the strikes were carried on virtually over the head of the official leadership of the union. The only one of the regular officials who really participated in a direct way in the actual leadership of the strikes was Bill Brown, along with the Organizing Committee. This Organizing Committee had one merit which was demonstrated in the beginning-other merits were revealed later-they knew how to organize workers. This is one thing the ossified labor skates in Minneapolis did not know and apparently could not learn. They know how to disorganize them. This breed is the same everywhere. They know how, sometimes, to let the workers into the unions when they break the doors down. But to go out and really organize the workers, stir them up and inspire them with faith and confidence-the traditional craft-union bureaucrat cannot do that. That is not his field, his function. It is not even his ambition. The Organizing Committee organized the workers in the trucking industry and then proceeded to line up the rest of the labor movement to support these workers. They did not lead them into an isolated action. They began working through the Central Labor Union, by conferences with the labor skates as well as by pressure from below, to put the whole labor movement in Minneapolis on record in support of these newly-organized truck drivers; worked tirelessly to involve the officials of the Central Labor Union in the campaign, to have resolutions passed endorsing their demands, to make them take official responsibility. When the time came for action, the labor movement of Minneapolis, as represented by the official unions of the American Federation of Labor, found themselves in advance in a position of having endorsed the demands and being logically bound to support the strike. This May general strike shook Minneapolis as it had never been shaken before. It shook the whole country, because this was no tame strike. This was a strike that began with such a wallop that the whole country heard about it, and about the role of the Trotskyists in its leadership-the bosses advertised that widely, and also hysterically. Then we saw again the same response among the observing radical workers that had followed our resolute action in the case of Field and the New York hotel strike. When they saw the performances in the May strike in Minneapolis, that same sentiment was expressed again: “These Trotskyists mean business. When they undertake anything, they go through with it.” The jokes about the Trotskyist “sectarians” began to turn sour. There was no essential difference between the strikers in Minneapolis and the workers involved in a hundred other strikes throughout the land in that period. Nearly all the strikes were fought with the greatest militancy by the workers. The difference was in the leadership and the policy. In practically all the other strikes the militancy of the rank and file workers was restrained from the top. The leaders were overawed by the government, the newspapers, the clergy and one thing or another. They tried to shift the conflict from the streets and the picket lines to the conference chambers. In Minneapolis the militancy of the rank and file was not restrained but organized and directed from the top. All modern strikes require political direction. The strikes of that period brought the government, its agencies and its institutions into the very center of every situation. A strike leader without some conception of a political line was very much out of date already by 1934. The old-fashioned trade union movement, which used to deal with the bosses without governmental interference, belongs in the museum. The modern labor movement must be politically directed because it is confronted by the government at every turn. Our people were prepared for that since they were political people, inspired by political conceptions. The policy of the class struggle guided our comrades; they couldn’t be deceived and outmaneuvered, as so many strike leaders of that period were, by this mechanism of sabotage and destruction known as the National Labor Board and all its auxiliary setups. They put no reliance whatever in Roosevelt’s Labor Board; they weren’t fooled by any idea that Roosevelt, the liberal “friend of labor” president, was going to help the truck drivers in Minneapolis win a few cents more an hour. They weren’t deluded even by the fact that there was at that time in Minnesota a Farmer-Labor Governor, presumed to be on the side of the workers. Our people didn’t believe in anybody or anything but the policy of the class struggle and the ability of the workers to prevail by their mass strength and solidarity. Consequently, they expected from the start that the union would have to fight for its right to exist; that the bosses would not yield any recognition to the union, would not yield any increase of wages or reduction of the scandalous hours without some pressure being brought to bear. Therefore they prepared everything from the point of view of class war. They knew that power, not diplomacy, would decide the issue. Bluffs don’t work in fundamental things, only in incidental ones. In such things as the conflict of class interests one must be prepared to fight. Our people had a commissary all fixed up. They didn’t wait until the strikers were hungry. They had it organized beforehand in preparation for the strike. They set up an emergency hospital in a garage-the strike headquarters was in a garage-with their own doctor and their own nurses before the strike even broke. Why? Because they knew that the bosses, their cops, and thugs and deputies would try in this case, as in every other, to beat the strike down. They were prepared to take care of their own people and not let them be sent, if injured, to a city hospital and then placed under arrest and put out of commission. When a fellow worker was injured on the picket line they brought him to their own headquarters and doctored him up there. They took a leaf from the Progressive Miners of America and organized a Women’s Auxiliary to help make trouble for the bosses. And I tell you, the women made lots of trouble, running around protesting and scandalizing the bosses and the city authorities, which is one of the most important political weapons. The strike leadership organized picketing on a mass basis. This business of appointing or hiring a few people, one or two, to watch and count and report how many scabs have been hired, doesn’t work in a real struggle. They sent a squad to keep any scabs from going in. I mentioned that they had their strike headquarters in a garage. This was because the picketing was put on wheels. They not only organized the pickets, they mobilized a fleet of picketing cars. Every striker worker, sympathizer and trade unionist in town was called upon to donate the use of his car or truck. The strike committee thus had a whole fleet at its disposal. Flying squads of pickets on wheels were stationed at strategic points throughout the town. Whenever a report came in of a truck being operated or any attempt to move trucks, the “dispatcher” called through the loudspeaker in the garage for as many cars, loaded with pickets, as were needed to go out there and give the operators of the scab trucks an argument. The “dispatcher” in the May strike was a young man named Farrell Dobbs. He came out of a coal yard in Minneapolis into the union and the strike, and then into the party. He first became known to us as a dispatcher who shot out the squad cars and the pickets. At first the pickets went out barehanded, but they came back with broken heads and injuries of various kinds. Then they equipped themselves with shillalahs for the next trips. A shillalah, as any Irishman can tell you, is a blackthorn stick you lean on in case you suddenly go lame. Of course, it is handy for other purposes too. The attempt of the bosses and the police to crush the strike by force culminated in the famous “Battle of the Market.” Several thousand special deputies in addition to the whole police force were mobilized to make one supreme effort to open up a strategic part of the town, the wholesale market, for the operation of trucks. Those deputies, recruited from the petty-bourgeois and the employing classes of the town, and the professions, came to the market in a sort of gala holiday spirit. They were going to have fun down there just beating up strikers. One of the special deputies wore his polo hat. He was going to have one hell of a time down there, knocking strikers’ heads around like polo balls. The ill-advised sportsman was mistaken; it was no polo game this time. He and the whole mob of deputies and cops ran into a mass of determined, organized pickets of the union supplemented by sympathetic unionists from other trades and by members of the unemployed organizations. The attempt to drive the pickets from the marketplace ended in failure. The counter-attack of the workers put them to flight. The battle has gone down in Minneapolis history as “The Battle of Deputies Run.” There were two casualties, and they were both on the other side. That was one of the features of the strike that lifted Minneapolis high in the estimation of the workers everywhere. In strike after strike of those days the same story had been monotonously repeated in the press: Two strikers killed; four strikers shot; twenty strikers arrested, etc. Here was a strike where it wasn’t all one-sided. There was one universal burst of applause, from one end of the labor movement to the other, for the militancy and resoluteness of the Minneapolis fighters. They had reversed the trend of things, and worker militants everywhere praised their name. As the organizing campaign developed, our National Committee in New York was informed of everything and collaborated as much as possible by mail. But when the strike broke out we were fully conscious that this was the time for us to do more, to do all that we possibly could to help. I was sent to Minneapolis by airplane to assist the comrades, especially in the negotiations for a settlement. This was the time, you will recall, when we were still so poor that we couldn’t afford a telephone in the office. We had absolutely no financial basis for such extravagant expenses as airplane fares. But the consciousness of our movement was expressed very graphically in the fact that in the moment of necessity we found the means to pay for an airplane trip to save a few hours time. This action, taken at an expense far beyond what our budget could normally carry, was designed to give the local comrades involved in the fight the benefit of all the advice and assistance we could offer, and to which, as members [of the Trotskyist Communist League of America], they were entitled. But there was another aspect, just as important. In sending a representative of the NC to Minneapolis our League meant to take responsibility for what they were doing. If things went wrong-and there is always the possibility that things will go wrong in a strike-we meant to take responsibility for it and not leave the local comrades to hold the sack. That has always been our procedure. When any section of our movement is involved in action, the local comrades are not left to their own resources. The national leadership must help and in the final analysis take the responsibility. The May strike lasted only six days and a quick settlement was reached. The bosses were swept off their feet, the whole country was clamoring to get the thing settled. There was pressure from Washington and from Governor Olson. The settlement was severely attacked by the Stalinist press, which was very radical at that time, because it was not a sweeping victory, but a compromise; a partial victory that gave recognition to the union. We took full responsibility for the settlement our comrades had made, and took up the challenge of the Stalinists. Our press simply chased the Stalinists off the field in this controversy. We defended the settlement of the Minneapolis strike and frustrated their campaign to discredit it and thereby to discredit our work in the unions. The radical labor movement was given a complete picture of this strike. 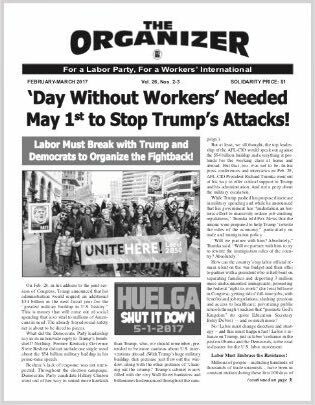 We published a special issue of The Militant which described in detail all the different aspects of the strike and the preparations leading up to it. This issue was written almost entirely by the leading comrades in the strike. The main point around which we wove the explanation of the compromise settlement was: what are the aims of a new union in this period? We pointed out that the American working class is still unorganized, atomized. Only a part of the skilled workers are organized into craft unions, and these do not represent the great mass of American labor. The American workers are an unorganized mass and their first impulse and need is to take the first elementary step before they can do anything else; that is, to form a union and compel the bosses to recognize that union. Thus we formulated the problem. We maintained – and I think with full justice – that a group of workers, who in their first battle gained the recognition of their union, and on that basis could build and strengthen their position, had accomplished the objectives of the occasion and should not overtax their strength and run the danger of demoralization and defeat. The settlement proved to be correct because it was enough to build on. The union remained stable. It was not a flash in the pan. The union began to forge ahead, began to recruit new members and educate a cadre of new leaders. As the weeks went by it became clear to the bosses that their scheme to trick the truck drivers out of the fruits of their struggle was not working so well. Then the bosses came to the conclusion that they had made a mistake; that they should have fought longer and broken the union, so as to teach the workers of Minneapolis the lesson that unions could not exist there; that Minneapolis was an open-shop slave town and should remain that way. Somebody gave them some bad advice. The Citizens Alliance, the general organization of the employers and labor haters, kept needling and inciting the bosses in the trucking industry to break the agreement, to chisel and stall on the concessions they had agreed to give, and whittle away the gains that had been made by the workers. The leadership of the union understood the situation. The bosses had not been sufficiently convinced by the first test of strength with the union and needed another demonstration. They began to prepare another strike. Again the workers in the industry were prepared for action. Again the whole labor movement of Minneapolis was mobilized to support them, this time in the most impressive, the most dramatic fashion. The campaign for the adoption of resolutions in the Central Labor Union and its affiliated unions in support of Local 574 was pointed toward a great parade of organized labor. The members of the various unions turned out in force and marched in solid ranks to a huge mass meeting in the City Auditorium, to back up the truck drivers and pledge them support in the impending struggle. It was an imposing demonstration of labor solidarity and of the new militancy which had taken hold of the workers. The bosses remained obdurate. They raised the “Red Scare” in a big way, denouncing the “Trotsky Communists” in screaming advertisements in the newspapers. On the union side, preparations went ahead as in the May strike, but on an even more highly, organized plane. When it became clear that another strike could not be avoided without sacrificing the union, our National Committee decided that the whole Communist League of America would have to go all-out in its support. We knew that the real test was here, that we dared not dabble with the issue. We sensed that here was a battle that could make or break us for years to come; if we gave half-hearted support, or withheld this or that aid which we could give, it might tip the balance between victory and defeat. We knew that we had plenty to give to our Minneapolis comrades. After I had been there a few days, we agreed to call in more aid-a whole staff, in fact. The strike began July 16, 1934, and lasted five weeks. I think I can say without the slightest exaggeration, without fear of any contradiction, that the July-August strike of the Minneapolis truck drivers and helpers has entered into the annals of the history of the American labor movement as one of its greatest, most heroic and best organized struggles. Moreover: the strike and the union forged in its fires are identified forever in the labor movement, not only here but all over the world, with Trotskyism in action in the mass movement of the workers. Trotskyism made a number of specific contributions to this strike which made all the difference between the Minneapolis strike and a hundred others of the period, some of which involved more workers in more socially important localities and industries. Trotskyism made the contribution of organization and preparations down to the last detail. That is something new, that is something specifically Trotskyist. Second, Trotskyism introduced into all the plans and preparations of the union and the strike, from beginning to end, the class line of militancy; not as a subjective reaction-that is seen in every strike-but as a deliberate policy based on the theory of the class struggle, that you can’t win anything from the bosses unless you have the will to fight for it and the strength to take it. The third contribution of Trotskyism to the Minneapolis strike-the most interesting and perhaps the most decisive-was that we met the government mediators on their own ground. I tell you, one of the most pathetic things observable in that period was to see how in one strike after another the workers were outmaneuvered and cut to pieces, and their strike broken by the “friends of labor” in the guise of federal mediators. These slick rascals would come in, take advantage of the ignorance and inexperience and political inadequacy of local leaders, and assure them that they were there as friends. Their assignment was to “settle the trouble” by extorting concessions from the weaker side. Inexperienced and politically unschooled strike leaders were their prey. They came into Minneapolis all greased up for another standard performance. We were sitting there waiting for them. We said, “Come on. You want to negotiate, do you? All right. That is fine.” Of course our comrades put it in the more diplomatic language of the negotiations “protocol,” but that was the gist of our attitude. Well, they never negotiated two cents out of the Trotskyist leaders of Local 574. They got a dose of negotiations and diplomacy which they are still gagging from. We wore out three of them before the strike was finally settled. The federal mediators would try to convince the strike leaders that they were “big shots” who must take a “responsible” attitude. This routine cut many a strike to pieces in that period. It didn’t work in Minneapolis. Our people weren’t “big shots” in the negotiations at all. They made it clear that their authority was extremely limited, that they were in fact the more moderate and reasonable wing of the union, and that if they took a step out of line they would be replaced on the negotiations committee by other types. Every once in a while Grant Dunne would be added to the Committee. He would just sit in a corner saying nothing, but scowling every time there was any talk of concessions. The strike was a hard and bitter fight but we had plenty of fun in planning the sessions of the union negotiations committee with the mediators. We despised them and all their wily artifices and tricks, and their hypocritical pretenses of good fellowship and friendship for the strikers. They were nothing but the agents of the government in Washington, which in turn is the agent of the employing class as a whole. That was perfectly clear to a Marxist, and we took it as rather an insult for them to assume that we could be taken in by the methods they employed with novices. They tried it though. Apparently they didn’t know any other methods. But they didn’t make an inch of headway until they put pressure on the bosses and made concessions to the union. The collective political experience of our movement was very useful in dealing with the federal mediators. Unlike stupid sectarians, we didn’t ignore them. Sometimes we would initiate discussions. But we didn’t let them use us, and we didn’t trust them for one moment. Our general strategy in the strike was to fight it out, not give anything away to anybody; to hold on and fight it out. That was Trotskyist contribution number four. It may appear to be a very simple and obvious prescription, but that is not the case. It was not obvious to the great majority of strike leaders of the time. The fifth and crowning contribution that Trotskyism made to the Minneapolis strike was the publication of the daily strike newspaper, the Daily Organizer. For the first time in the history of the American labor movement, strikers were not left dependent on the capitalist press; were not befuddled and terrorized by it; did not see public sentiment disoriented by the capitalist monopoly of the press. The Minneapolis strikers published their own daily newspaper. This was done not by half-million coal miners, a hundred thousand auto or steel workers, but by a single local union of 5,000 truck drivers, a new union in Minneapolis which had Trotskyist leadership. This leadership understood that publicity and propaganda are highly important, and that is something very few trade union leaders know. It is almost impossible to convey the tremendous effect of this daily newspaper. It wasn’t a big one-just a two-page tabloid. But it completely counteracted the capitalist press. After a day or two we didn’t care what the daily papers of the bosses said. They printed all kinds of things but it didn’t make that much difference in the ranks of the strikers. They had their own paper and took its reports as gospel. The Daily Organizer covered the town like a blanket. Strikers at the headquarters all used to get it straight from the press. The women’s auxiliary sold it in every tavern in town that had working class customers. In many saloons in working class neighborhoods they would leave a bundle of papers on the bar with a slotted collection can beside them for contributions. Many a dollar was collected that way and carefully watched by the friendly bartenders. Union men used to come from the shops and railroad yards every night to get bundles of the Organizer for distribution among the men on their shifts. The power of that little paper, its hold on the workers, is indescribable. They believed the Organizer and no other paper. Occasionally a story would appear in the capitalist press about some new development in the strike. The workers wouldn’t believe it. They would wait for the Organizer to see what the truth was. Press distortions of strike incidents and outright fabrications-which have destroyed the morale of many a strike-didn’t work in Minneapolis. More than once, among a crowd that always surged around strike headquarters when the latest issue of the Organizer was delivered, one could hear remarks such as this: “You see what the Daily Organizer. This powerful instrument didn’t cost the union a penny. On the contrary, the Daily Organizer made a profit from the first day and carried through when there was no money in the treasury. The profits of the Organizer paid the daily expenses of the commissary. The paper was distributed free to anyone who wanted it, but nearly every sympathetic worker gave from a nickel to a dollar for a copy. The striking workers were armed and prepared in advance for every move of the mediators or Governor Olson. We would be poor Marxists if we couldn’t see 24 hours in advance. We called the turn so many times that the strikers began to take our forecasts as news and to rely upon them as such. The Daily Organizer was the greatest of all the weapons in the arsenal of the Minneapolis strike. I can say without any qualification that of all the contributions we made, the most decisive, the one that tipped the scale to victory, was the publication of the daily paper. Without the Organizer the strike would not have been won. All these contributions which I have mentioned were integrated and carried out in the greatest harmony between the staff sent by the National Committee [of the Communist League] and the local comrades in the leadership of the strike. There was the closest collaboration from beginning to end. The strike presented Floyd Olson, Farmer-Labor governor, with a hard nut to crack. We understood the contradictions he was in. He was, on the one hand, supposedly a representative of the workers; on the other hand, he was governor of a bourgeois state, afraid of public opinion and afraid of the employers. He was caught in a squeeze between his obligation to do something, or appear to do something, for the workers and his fear of letting the strike get out of bounds. Our policy was to exploit these contradictions, to demand things of him because he was labor’s governor, to take everything we could get and holler every day for more. On the other hand, we criticized and attacked him for every false move and never made the slightest concession to the theory that the strikers should rely on his advice. Pushed and pounded from both sides, afraid to help the strikers and afraid not to, Floyd Olson declared martial law. This is really one of the most fantastic things that ever happened in the history of American labor. A Farmer-Labor governor proclaimed martial law and stopped the trucks from running. That was supposed to be one on the side of labor. But then he allowed the trucks to run again under special permits. That was one for the bosses. Naturally the pickets undertook to stop the trucks, permit or no permit. Then, a few days later, the Farmer-Labor governor’s militia raided the headquarters of the strike and arrested the leaders. I am jumping a little ahead of the story. Upon the declaration of martial law, the first casualties, the first military prisoners of Olson and his militia became myself and Max Shachtman. I don’t know how they found out we were there, as we were not very conspicuous in public. But Shachtman was wearing a great big ten-gallon cowboy hat-where he got it, or why in God’s name he wore it, I never knew-and that made him conspicuous. I suppose that is how they located us. One evening Shachtman and I came away from the strike headquarters, walked downtown and, being in need of diversion, looked around to see what shows were playing. Toward the lower end of Hennepin Avenue we were confronted with two alternatives: in one place a burlesque show, next door a movie. Which to go to? Well, naturally, I said the movie. A couple of detectives, who had been on our trail, followed us in and arrested us there. What a narrow escape from being arrested in a burlesque show. What a scandal it would have been. I would never have lived it down, I am sure. They kept us in jail for about 48 hours; then took us into court. I never saw so many bayonets in one place in my life as there were in and around the courtroom. All these young white collar squirts in the militia seemed to be quite eager to get a little bayonet practice. Some of our friends were in the court watching the proceedings. Finally the judge turned us over to the military, and Shachtman and I were marched down the corridors and down the stairs between two rows of bayonet-clutching militiamen. As they were marching us out of the courthouse, we heard a shout overhead. Bill Brown and Mick Dunne were sitting comfortably up in a third-floor window watching the procession, laughing and waving at us. “Look out for those bayonets,” Bill shouted. Anything for a laugh in Minneapolis. When a few days later Bill and Mick were arrested by the militia, they took it just as light-heartedly. They threw us into the guardhouse and kept two or three of these nervous rookies watching us with their hands on their bayonets all the time. [Our lawyer] Albert Goldman came down, threatening legal action. The militia chiefs seemed to be anxious to get us off their hands and avoid any trouble with this lawyer from Chicago. On our side, we did not care to make a test case of our detention. We wanted, above all, to get out so that we could be of some help to the steering committee of the union. We decided to accept the offer they made. They said, if you agree to leave town you can go. So we said, all right. We moved across the river to St. Paul. There every night we had meetings of the steering committee as long as any of the leading comrades were out of jail. The steering committee of the strike, sometimes with Bill Brown, sometimes without him, would get into a car, drive over there, talk over the day’s experiences and plan the next day. There was never a serious move made during the whole strike that was not planned and prepared for in advance. Then came the raid on the strike headquarters. One morning the troops of the militia surrounded the headquarters at 4:00 A.M. and arrested hundreds of pickets and all of the strike leaders they could lay their hands on. They arrested Mick Dunne, Vincent Dunne, Bill Brown. They “missed” some of the leaders in their hurry. Farrell Dobbs, Grant Dunne and some others slipped through their fingers. These simply set up another committee, and substitute headquarters in several friendly garages; the picketing, organized underground, went on with great vigor. The fight continued and the mediators continued their finagling. A man named Dunnigan was the first one sent into the situation. He was an impressive looking fellow who wore glasses suspended on a black ribbon and smoked expensive cigars, but he didn’t know very much. After trying vainly for a while to push the strike leaders around, he worked out a proposal for a compromise providing for substantial wage increases for the workers without granting their full demands. The strike leaders answered: “No, you can’t do that. A bargain’s a bargain. We accepted the Haas-Dunnigan plan. We are fighting for your plan. Your honor is involved here.” Whereupon Father Haas said-this is another threat they always hold over strike leaders: “We will appeal to the rank and file of the union in the name of the United States government.” That threat usually scares the pants off inexperienced labor leaders. But the Minneapolis strike leaders were not scared. They said: “All right, come on.” So they arranged a meeting for him. Oh, he got a meeting that he never bargained for. That meeting, like every other important action taken in the strike, was planned and prepared in advance. Father Haas had no sooner ended his speech than the storm broke over his head. One by one, the rank and file strikers got up and showed how well they had memorized the speeches that had been outlined in caucus. They almost drove him out of the meeting. They made him physically sick. He threw up his hands and left town. The strikers voted unanimously to condemn his treacherous attempt to wreck their strike and thereby their union. Dunnigan was finished, Father Haas was finished. Then they sent in a third federal mediator. He had obviously learned from the sad experiences of the others not to try any shenanigans. Mr. Donaghue, I think that was his name, got right down to business and in a few days worked out a settlement which was a substantial victory for the union. The names of a new galaxy of labor leaders flashed in the northwestern sky: William S. Brown; the Dunne brothers-Vincent, Miles and Grant; Karl Skoglund; Farrell Dobbs; Kelley Postal; Harry De Boer; Ray Rainbolt; George Frosig. The great strike came to an end after five weeks of bitter struggle during which there hadn’t been an hour free from tension and danger. Two workers were killed in that strike, scores injured, shot, beaten on the picket line in the battle to keep the trucks from running without union drivers. A great deal of hardship, a great deal of pressure of every kind was endured, but the union finally came out victorious, firmly established, built on solid rock as a result of those fights. We thought, and we wrote later, that it was a glorious vindication of Trotskyism in the mass movement. Minneapolis was the highest point of the second strike wave under the NRA. The second wave surged higher than the first, as the third wave was destined to transcend the second and reach the peak of the CIO sit-down strikes. The giant of the American proletariat was beginning to feel its power in those years, was beginning to show what tremendous potentialities, what resources of strength, ingenuity and courage reside in the American working class. The third wave, culminating in the sit-down strikes, confirmed that prediction and gave us ground to look forward with the greatest optimism to still greater, more grandiose demonstrations of the power and militancy of the American workers. In Minneapolis we saw the militancy of the workers fused with a politically conscious leadership. Minneapolis showed how great can be the role of such leadership. It gave great promise for the party founded on correct political principles and fused and united with the mass of American workers. In that combination one can see the power that will conquer the whole world.